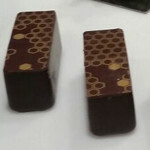 Michel Cluizel: Mini rectangular fine dark chocolate cup with French couverture. Perfect for bouchÚes & petits fours. L60 x D20 x H25 mm. Cocoas (72%), Sugar, Cocoa Butter, Bourbon Vanilla pod. Allergy Advice: for allergens see ingredients in CAPITALS. May also contain traces of gluten, milk, almonds, hazelnuts, pistachios and walnuts.